Well, I've been working on these for a while, and figured I'd show you my progress. EDIT: I have finished ALL 151 POKEMON! What do you think? I've been working on these for a long time. Any criticisms/ideas? What is your technique for making sprites? animated!!! That would be so cool!!! Seriously, what is your process for making sprites? 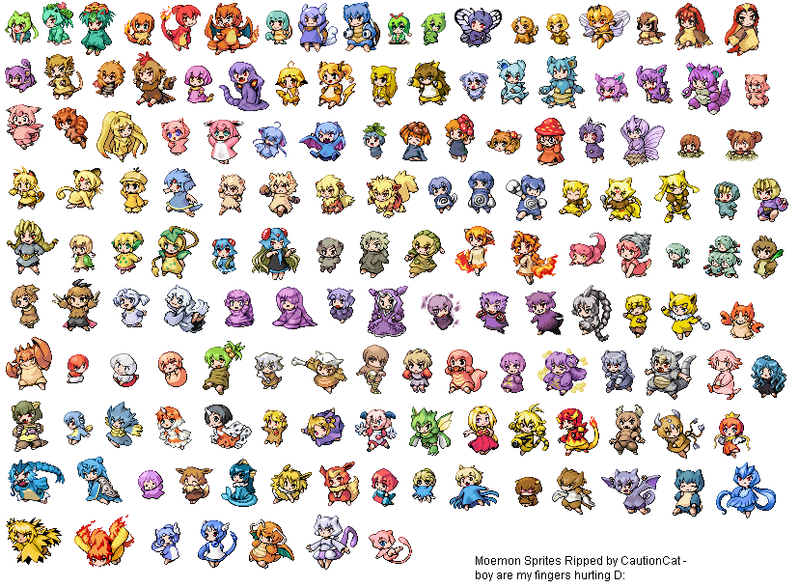 I used a program called CalcGS to draw each of the sprites pixel by pixel, looking at various sources for reference. I differ them slightly so I can smoothly animate them. The sprites are 32x32 and I have spent the last couple of weeks on this. Spriting is one of my skills, so while it was difficult, its wasn't too much so, even if it takes a while. and yep, animated. Frame 1 will probably be the frame you see most of the time, but when it animated you will see maybe frames 1-2-3-2-3-2-1 in rapid succession, like when you let a pokemon out, for battle. EDIT: As long as this topic stays bumped I'll keep you guys informed of my progress and post new pics, so don't worry. Absolutely bloody fantastic. Speaking of blood, one criticism I have is the bleeding of the sprite outside of the frame, causing pixels to vanish. You probably can't do much about that in most cases (without shrinking the sprite, which is opening another whole can of worms). Other than that, this is terribly good. Absolutely bloody fantastic. Speaking of blood, one criticism I have is the bleeding of the sprite outside of the frame, causing pixels to vanish. Other than that, this is terribly good. Eh, someone else didn't like that either, but I didn't have much choice. keeping them with 32x32 was easier, and since they'll be located at the edge of the screen almost all the time, It'll look like the offending appendage is offscreen. Cool! And... they are seriously NOT copied?? I mean original-pixel-copied? Wow! Charizard's mouth should be opened at least on one sprite. Oh, that goes for the other monsters too. It uses celticIII so he can use multiple pics. I could, but I'll be using their hex codes as strings instead. That way I can store them all in a few programs and use lineread to recall them. EDIT: I'll actually be using Celtic for a LOT of things, not just the graphics. It's ability to read from the archive is definitely useful, and it still has all the xLib commands I'm comfortable with. I'll be using their hex codes as strings instead. That way I can store them all in a few programs and use lineread to recall them. You understand that you'll use twice as much memory as you actually need this way? Each byte takes two hex digits (nibbles) so two bytes when stored as text... Given the already huge size of the graphics data this sound ver very dumb. Besides reading will introduce an overhead when converting the string to hex number. you assume correctly. I will be storing the RAW hex into appvars. Celtic will recall a line in an appvar as a string to be used however I need it. The average user should not NEED to read it anyway. The string thing is just how Celtic handles everything, I really have limited control over that. Why not use a small asm program to change the graph screen into a string, and then write it to the appvar. Then you could read it to a picture with another asm program. a libary AND asm progs? If you wanted to you could create a program, write the hex code to that program using Celtic III's line write, then delete the program. Vanishing?!? How do topics "vanish"? Go to the General Coding and Design forum (or wherever your last topics were), and look above and to the right of the ads. Click on the From: field and select Show All, then press the Go button. © Copyright 2000-2019 Cemetech & Christopher Mitchell :: Page Execution Time: 0.194916 seconds.